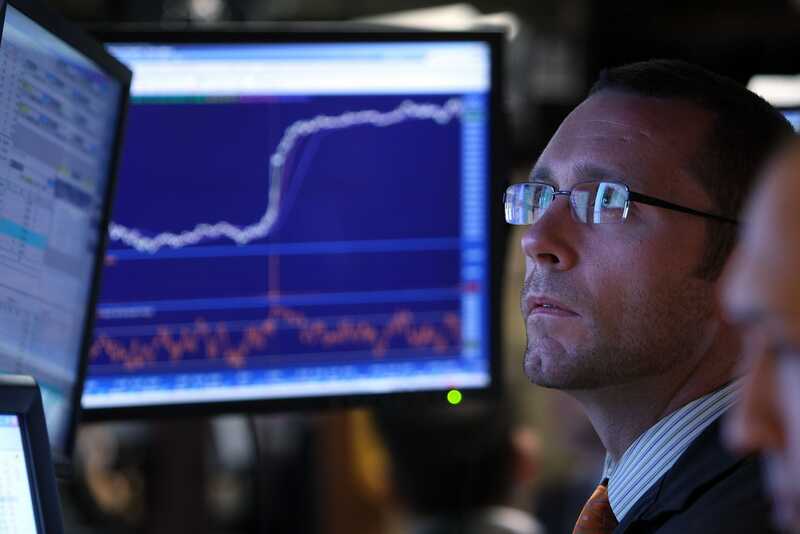 Spencer Platt/GettyA trader works on the floor of the New York Stock Exchange moments before the closing bell on June 1, 2009 in New York City. Despite the news of General Motors Corp.�s bankruptcy filing, the Dow closed up over 200 points following positive economic news for U.S. manufacturing, consumer and construction spending. The Dow had posted its best day since March on Wednesday after the Federal Reserve chairman gave a speech received as dovish. Stocks fell Thursday amid concerns about escalating trade tensions, a day after Federal Reserve comments received as dovish helped the Dow rally by the most in eight months. The Dow Jones Industrial Average fell 0.11%, and the Nasdaq Composite shed 0.25%. The S&P 500 was down 0.22%. The three major US indices had risen for a third straight session Wednesday after Federal Reserve Chairman Jerome Powell said rates were “just below” the neutral level. “Markets were cheered by Powell’s dovish remarks, but trade dispute rhetoric between the US and China ahead of this weekend’s G20 summit is keeping a lid on investor enthusiasm,” said Vincent Heaney, a strategist at UBS. Minutes from the Federal Reserve’s latest policy meeting out Thursday pointed to a December rate increase, but left the path for next year open. Market watchers have been closely monitoring for signs of whether recent equity turbulence or ongoing trade tensions could influence the Federal Reserve’s rate path. Yields on the 10-year note fell 1.6 basis points to 3.028% following the minutes, and the dollar rose slightly against a basket of peers. President Donald Trump and China’s Xi Jinping are expected to meet at the G20 summit in Argentina this weekend. Trump has offered conflicting remarks about negotiations in recent days, however, stirring fears that more tariffs could be put in place between world’s largest economies. “I think we’re very close to doing something with China but I don’t know that I want to do it,” he told reporters Thursday, referring to a potential deal to ease tensions first reported by The Wall Street Journal. Not helping the mood,Reuters reportedThursday afternoon that White House trade adviser Peter Navarro, a vocal critic of China who is seen as a policy hardliner, is expected to attend the Trump-Xi meeting. On the commodities front, oil rose 3% after Russia signalled it could cut production. With West Texas Intermediate trading below $US50 a barrel at session lows and Brent around $US60, however, prices are still deep in bear territory. OPEC and other major producers are set to discuss coordinated output levels at a meeting next week.